To make the game playable, you need to currently build Wine from source, applying virtual heap fix patch, buffer pool fix patch, and sample_c_lz hack patch (see howtos). After that, set CSMT and OpenGL version in registry (see howtos), and install xact_jun2010 (see howtos). After that it produces very good result, but since it requires all these manual steps, I'm still giving it bronze rating. Intro videos work (with workaround). Gameplay works, I got up until White Orchard without issues. CPU: Intel Core i7 4770. I get around 40 fps with the above setup (max settings, HBAO+ enabled. Hairworks is off). There are occasional glitches here and there, like puppeteer lines (bug #43160) and dark opaque surface distortion (bug #43158) but they are uncommon at least in the areas I played in so far. Didn't finish the game yet and didn't play any expansions. I picked Wine, and not Wine staging, since it's something in between. 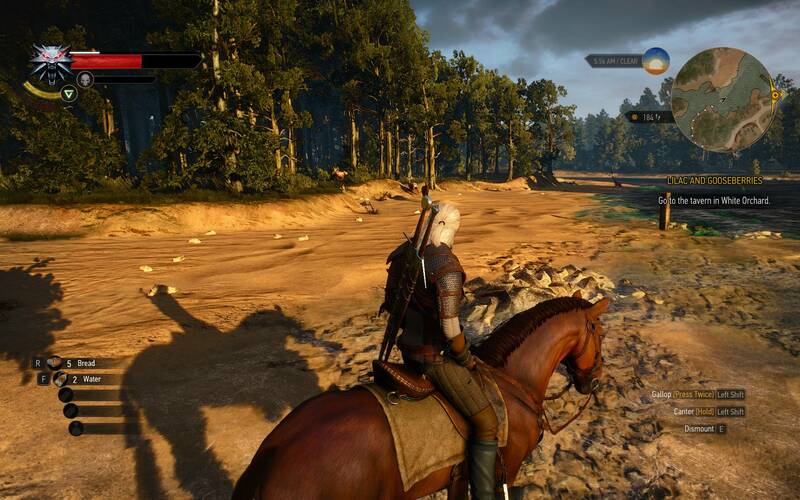 Currently with wined3d, The Witcher 3 is still affected by CPU-GPU buffer maps synchronization issue (bug #44315). It severely degrades performance. Using dxvk instead of wined3d is the best course of action, since it performs very well, and also provides perfect rendering, as long as your Vulkan driver supports VK_EXT_transform_feedback extension. I have weird graphical glitches when playing the game with SSAO. For example, the video linked in  (while I am using dxvk in the linked video, the issue is also present when using wined3d) shows small black shadowy things flashing on the tub. They also appear in other places, like on clothes, mostly during scripted scenes. Interestingly, they do not appear when I switch to HBAO+. Does anyone else also experience this and might have an idea if this is rather an issue in the game, a driver bug or something else? I am using an RX 580 with mesa git on commit c3eaf8fe5746e5b29a46a076247ba072c84e2ec5, kernel 4.17.9 with the Gentoo patchset and vanilla wine on version 3.13. I tried that, with current Staging and the performance have increased indeed, but still not enough to be playable. I'm going to try your custom patches next. Thanks for your help! Sadly the game just won't run for no good reason. The first time it did and worked, then second time it didn't, but running winecfg and closing it fixed it - then this repeated a few times, then it stopped running ever. I tried re-installing it, didn't help. Tried both normal wine and staging, didn't help. 002e:err:winediag:wined3d_dll_init Setting multithreaded command stream to 0.
wine: configuration in '/home/storm/misc/wine-prefixes/witcher3' has been updated. 005d:err:winediag:wined3d_dll_init Setting multithreaded command stream to 0. Arch Linux 64 bit and 64 bit prefix. Not sure if it's me doing something wrong, or it's a bug and I should make a ticket. P.s. : I mentioned this to Shmerl already, but could not help so I'm writing here now, maybe someone else can give a tip. You should be starting the game from the directory where the binary (witcher3.exe) is located. It won't work otherwise. Now only if I could improve FPS futher. With the same settings I got 50-60 FPS under the dual booted Win 10, and 5 FPS under Wine. I added the CSMT registry entries. Threaded optimization enabled/disabled makes no noticeable difference whatsoever (nVidia proprietary). Is there anything else I can try (apart from lowering settings, of course)? I'm not getting too bad results with some additional patches to wine-vanilla. While I don't have a dual-boot setup to compare results, I usually have pretty decent fps, fluctuating between maybe 20 (especially in the Blood & Wine DLC areas) to something which looks perfectly smooth (so maybe up to 60 fps). Using GTX 1050 Ti, 1080p, high-settings, nvidia proprietary. NVIDIA HairWorks works with my patches, tho with graphical glitches (hair is rendered as a layer above everything else but performance seems good). If you used staging patches in the same wine prefix before, take care of removing the csmt dll redirections from the registry. I'm using Gentoo, so wine is compiled with CPU optimizations here (by setting appropriate useflags). I didn't rebase to 3.8 yet. There's another branch with performance patches cherry-picked from staging. Follow the instructions in the header descriptions to export patch files from the git clone which you could apply to your source package. BTW: Please try running with "WINEDEBUG=-all" as generating all those fixme messages (even when hidden) hurts performance a lot. I'm using Staging. Are your patches cherry-picked from Staging too? If so, shouldn't using staging have the same result? I have GeForce GTX 750 Ti. Because there are none needed at present. I can remove that from the howto, it's reflecting the situation from the past. I just got an xbox one controller and that required some fixes to work in the game. What took me the longest to figure out was that two xinput dlls needed to be present in the game folder. xinput1_3.dll was already there but xinput9_1_0.dll was not. I can make into a howto if you think it's useful, though I don't have a controller to test it. Howto for Gamepad in linux with wine. I put two days into finding out how to make my gamepad controller work in linux with wine. Here is my findings with what I mostly lacked in the other instructions, testing of each step to make sure it works so far. 1. Connect the controller with USB. If you can cable in, do this first to test. Just make sure that it really can communicate through the cable and not just charge. where xxxx:xxxx is your identifiying numbers for the gamepad. A reasonably modern linux already have the xpad driver in the kernel. I use this. Others mention that they prefer xboxdrv or some drv from steam. To test that linux picks up what the gamepad sends, install and use either of antimicro, jstest-gtk or sdl-test. Google for repos. They give a simple representation of keypresses as the gamepad sends them. A parameter needs to be set and the control re-paired for the connection to hold. Apparently, the controller exposes another api when connected by bluetooth, and for my particular controller, this is buggy. The controller mapping in my case is wrong. Test again with something like antimicro. The solution for now is rather hacky, and yes, I program for a living, but I will still stay with cable until this bug is sorted. Hope you are in luck with your controller. 3. Make the controller work in wine. Start wine's, control panel to test the gamepad. This brings up a graphical interface wher you can select "game controllers" and test the controller. Great job, wine now picks up signals from the controller. 4. Make the controller work in your game. This puzzled me a lot. A few more hours of googling, some controllers don't communicate the way that the game is expected. Translation is nescessary. People seem to prefer x360ce, which I was able to install for wine32. Drop both xinput1_3.dll and xinput9_1_0.dll into the same folder as the exe and the game receives the controller signals. As my controller still suffers from the BT bug, I'm on cable but everything works fine there. Until then the game remains perfectly playable on a GTX1060 3GB / AMD Ryzen 1700X / 32GB DDR4 but even still the FPS is still pretty low for this hardware. Mesa freeze bug is very game breaking though, so I consider it unplayable with Mesa, at least in Velen. I play the game now with GTX 1080 Ti, Intel 3770, 16GB DDR3 and proprietary driver, but performance is really slow, around 15-30 FPS, constantly changing. Yes, it's playable but it's slow. I can achieve 60FPS only in inventory window. What are you using to track your FPS? Also what resolution? Fix for dark textures coming? RE: Fix for dark textures coming? I can confirm that this has fixed the cutscene issue! The game runs flawlessly for me now on nvidia blob. I'm sure several other issues will be fixed b/c of this. Basically when initiating a cutscene the textures would pop in all black... 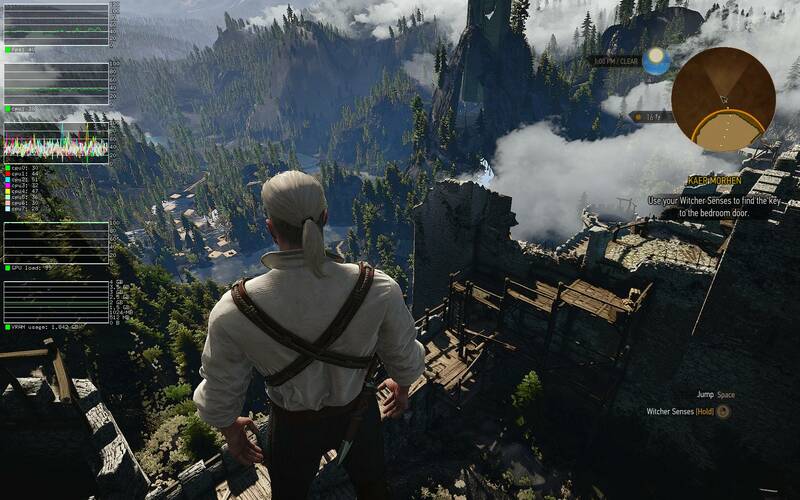 I believe this is because witcher 3 uses higher res textures during cutscenes. So when they are swapped using d3d11_deferred_context_CopySubresourceRegion which was unimplemented it failed. I dont know much about DX but thats just my theory. I see. I never had this issue with Mesa though. For FPS I use glxosd. I play at 1920@1080 but in lower resolutions there isn't any benefit. It appears that, at least on my system, the MaxVersionGL registry setting is breaking Red Alert 3. 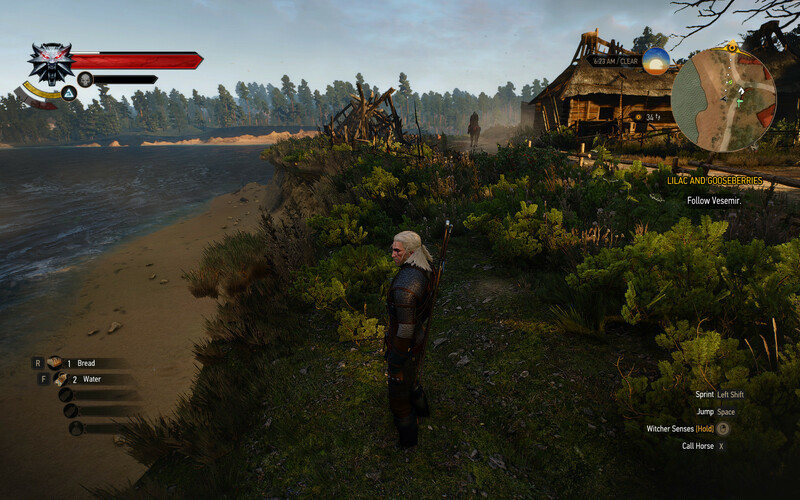 On the other hand, Witcher 3 (gog version) seems to be working fine without it. Is this registry setting really needed? It is needed, unless you are using Wine staging, which includes a patch that makes it not required anymore. This explains why the game works without setting MaxVersionGL. I'm using wine-staging on arch linux, one wine configuration for all my apps. I recommend installing each game in its own Wine prefix, which this very issue illustrates. It makes managing them separately easier. Using Debian Stretch amd64 + wine staging 2.11 (official build) game does not start at all there. err:winediag:wined3d_dll_init Setting multithreaded command stream to 0x1. err:winediag:wined3d_dll_init Setting maximum allowed wined3d GL version to 4.5.
fixme:d3d11:device_parent_create_swapchain_texture device_parent 0x8f9d0, container_parent 0xdca50, wined3d_desc 0x213ed20, texture flags 0, wined3d_texture 0xdcae0 partial stub! fixme:d3d11:device_parent_create_swapchain_texture Implement DXGIwined3d usage conversion. Not sure, that looks like some new issue to me. May be it's some regression in Nvidia driver? Try to disable CSMT. I noticed that staging CSMT is crashing quite a number of games lately. No, it's not a CSMT issue as enabling or disabling it does not have any effect. If I switch to wine-devel at least I have an error popup, which I do not have with wine-staging. I have this problem as well on the wine staging 2.12 with NVIDIA blob. I've attached debug output for someone who knows what they're doing to take a look...Sorry I did debug all I wasn't sure what the best flags to use are. I can use different flags if anyone wants to see different output. wine: configuration in '/home/zinigor/wine/w3' has been updated. fixme:d3d11:device_parent_create_swapchain_texture device_parent 0x8e4a0, container_parent 0x9e5b0, wined3d_desc 0x212ed20, texture flags 0, wined3d_texture 0x9e640 partial stub! Also, try doing it with Wine master. I managed to get it working. For me it turned out that I needed to first change to the location of the executable, so I could run it without the path, just WINEPREFIX=/path/to/prefix/ wine witcher3.exe. And voila! Yes, that's usually the case. I put it all in a script. fixme:d3d11:d3d11_deferred_context_CopySubresourceRegion iface 0x7f1e5f948310, dst_resource 0x7f1e275957a0, dst_subresource_idx 6, dst_x 0, dst_y 0, dst_z 0, src_resource 0x7f1e26c17aa0, src_subresource_idx 5, src_box (nil) stub! Interesting. Can you try it with just a few patches from staging that are needed for the game, instead of all of them? Some other staging patches can cause regressions sometimes. I'll give it a try with Mesa soon, but would be good to see how it works with Nvidia blob too. And check whether ground there looks very dark? It's going to be easier to discuss it there. 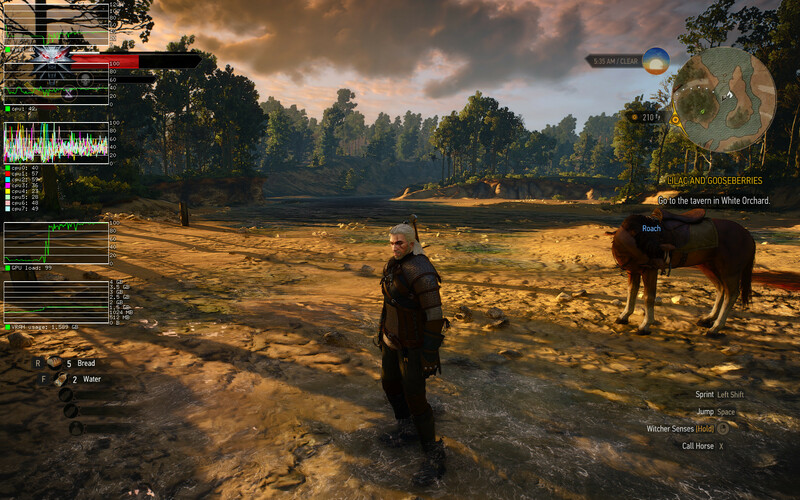 But now, in Velen, I hit a major problem: The game freezes, the entire machine locks up. No such issue in White Orchard. Can't post a save game here, but I'll upload one somewhere if someone wants to reproduce. I encountered that freeze too in the area where you start in Velen. Can you please open a bug about it? When I load a checkpoint save around that place, the freeze doesn't happen. Maybe someone with Nvidia graphics can try? Will be available for one month. And add that save as attachment. Reported. Let's hope someone can reproduce and figure out what's wrong. That's becasue initial CSMT support already landed in mainline WIne. Staging on the other hand isn't using that registry setting, but has a special dll override for direct3d when csmt is enabled. Though it doesn't hurt to set that key anyway, especially if you want to switch between staging / non staging for your tests. I set it for TW3 because I'm not using full blown staging, but mostly regular Wine with a few patches (which don't include staging way of dll override for CSMT). I.e. phrase "Same, but using staging wine with CSMT enabled" is somewhat misleading when referring to that registry setting. > Make sure to use the wine staging with CSMT registry settings snippet from the HOWTO on this page. > Make sure to enable CSMT with registry settings snippet from the HOWTO on this page. I think it's better to separate them, for more clarity, and reference the registry one from custom built one howto. There is one for registry setting already above. Just update it as needed, and remove that part from the custom wine (except for the reference to it) and it all will look neater. Thanks! Alternatively, you can just remove the first howto, and rely on the one for custom built Wine as is. You need to set these settings in registry, to enable OpenGL 4.5 usage for DirectX 11 and CSMT for better performance and avoiding various corruptions. Done, thanks for working on this! By the way, can you please post a new test result? I believe you're using something newer than wine-staging 2.4? I can't seem to run anything with wine-staging 2.9. To avoid having low framerate, make sure you have buffer pool patch from Wine staging, and you don't have colliding CSMT and threaded dispatch (with Nvidia blob you'd probably need to set: " __GL_THREADED_OPTIMIZATIONS=0. In Mesa threaded dispatch is off by default). The GPU though (Nvidia GeForce GT 520M) sounds pretty weak for the game, so low framerate can be simply caused by that. Official Nvidia minimum requirement if GTX 660. Is that for winetricks? How do you add that to the registry? Then, call regedit from your Wine installation, and do: Registry > Import Registry File. Find that file, in the dialog, and press "Open". (Use whatever prefix and other env variables you need to point to your proper Wine and installation prefix). I can't add a HOWTO to this version. Please add the registry setting to HOWTO note, in order to avoid posting it in each test submission. For some reason I can't add a HOWTO either. May be some Wine admins can help? I had no issues with howto's in other games.